We all hate walking into a dark and dingy property where the rooms have no natural light. We are naturally drawn to light. When we go into a property that has little or no natural light we automatically start to associate that property with problems like mould, mildew, termites and even structural problems. 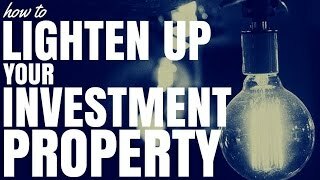 So what are some of the ways that we can lighten up our investment properties and thus add to its appeal when we put it on the market? Remove vegetation and structures that block sunlight. Often vegetation will start to grow over and cover the windows and prevent the sunlight from coming in. Things like old awnings or block-out walls could also be in the way of light getting into the property. If these are causing issues then pull them down or rip them out. This way you can maximise the window space and get as much light in as possible. It is amazing the difference it makes when you take away things that are in the way of the windows. Tip number two is to paint the room a light and neutral colour. Painting the room light will increase the amount of reflection that the walls have and allow more light to bounce around the room. This will make the room appear to be much lighter than if you were to use a darker colour. I’m also suggesting neutral colours because when we’re selling our property we generally want to appeal to the largest demographic of people so that people can get into a bidding war and bid the value of our property up. Painting the walls with unique or bright colours could segregate some people who then won’t want to buy the property. This may sound too easy but you’ll find that a lot of people don’t actually do it. Make sure that your windows are shiny and clean. Scrape off any paint spots or dirt that has built up over time. And you will find that this will increase the lighting in the room. It may not be a significant increase in light but every bit counts when we are selling a property. Those first impressions are very important. Cleaning the windows will make the property look of higher value and will also let more light in. Glass doors can be very helpful in dark hallways or other dark areas that have no windows of their own. If you want privacy you can consider using frosted glass or something similar. You won’t be able to see through it but it will still let light through. So glass doors are a really great way to lighten up areas that you otherwise wouldn’t be able to light up. Painting the window frames white will allow the most amount of light in. It also frames the room to look lighter than it would if you had dark framing of the windows. Again, lighter colour furniture reflects more light and therefore makes the room as a whole feel lighter. Darker furniture absorbs more light and therefore make the room feel darker. White furniture or white gloss furniture is going to reflect more light and make the room feel lighter. So try to invest in lighter furniture if you are having issue with darkness in your property. We all know that mirrors are consistently used to make a room feel bigger. But mirrors also have the added benefit of making a room feel lighter. They reflect an image and they reflect light. Therefore more light is bouncing around the room and that leads to making the room feel lighter. So consider having a decorative mirror as a feature artwork instead of having a canvas on the wall. It make the room look great and will add much-needed light. Sometimes rooms have doors or entry points that don’t really need to be there. In those cases, the door’s presence simply makes the room darker. So removing the doors and turning them into archways or simple openings will bring much more light into that room. They will effectively act as internal windows. So if you don’t need a door there then it may be worth getting rid of it. It could greatly improve the appeal of the property. And tip number nine is to consider installing skylights. This tip has been left until last because it is quite a bit more expensive. But it is something to consider if you find that the first eight tips don’t work for your property. Maybe you’re overshadowed by another property or maybe there are some other issues that you couldn’t deal with. You can then consider using skylights to light up a room. Skylights are great for places like hallways and bathrooms and toilets. But they’re not necessarily very good for places like bedrooms. Consider whether people are going to want constant light in a certain room. Some people may want to sleep during the day. Putting a skylight in the bedroom may actually put people away from your property. But skylights add a brilliant burst of natural light and are something that you can consider if all else fails. So there you have nine ways to lighten up your investment property and hopefully to lighten up the appeal as well. These tips can help your property to sell faster and to sell for more money.